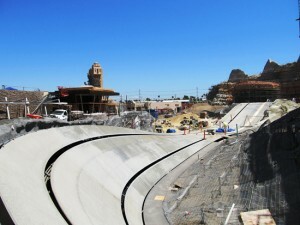 Set to open in Summer 2012, Disney’s California Adventure Park’s Cars Land is shaping up to look like an amazing experience. 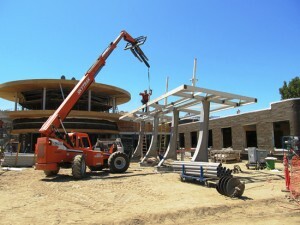 The following photographs offer a behind-the-scenes look at how various parts of the attraction are coming together. 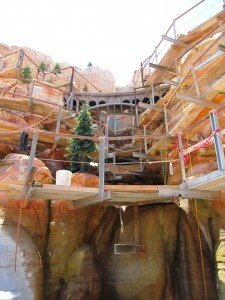 The Radiator Springs Racers are coming along nicely, with details emerging like the bridge in the photograph to the right. Cars will be speeding around the banked turn shown in another photograph, and in another part of town, Flo’s V8 Cafe is beginning to take shape. Across the street, you can catch a glimpse of Sally’s Cozy Cones. 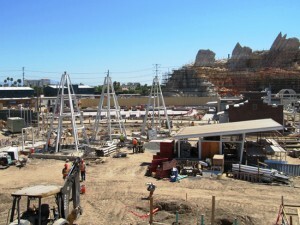 Construction on Cars Land seems to be moving right along, and we’ll keep you updated with further details on the progress of this new attraction while we wait for its debut date next year.